Tile Cleaning – Grout Magnificent uses a truck mounted high pressure steam system that does not use any harsh chemicals to clean and sanitize the floor. A benefit to using high pressure steam to clean is that it removes mold, mildew and bacteria that builds up in the grout, without risking damage to the grout. If you’ve noticed that your tile floor and grout still looks dirty even after mopping it, then it’s time to have us professionally clean it for you. Over time your floor will lose it’s nice shine and start to look dull. 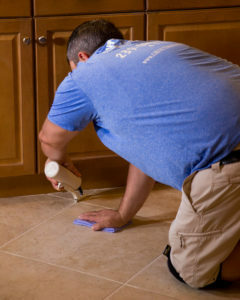 Grout Magnificent specializes in cleaning tile and grout so that it looks like new once again. Grout Color Sealing: Our most popular choice to create a uniform grout color while permanently sealing the grout. Penetrating Grout Clear Seal – Used to protect and seal the newly cleaned grout from dirt and spills. Call us for all of your tile and grout cleaning and sealing needs in Cape Coral and surrounding areas! You can get more info right here on all of our services!